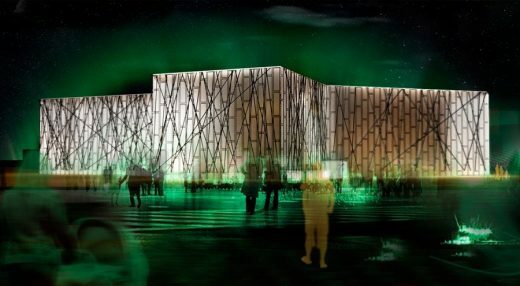 “Vigdis Foundation” (Stofnun Vigdísar Finnbogadóttur) is one of the most important institutions for the internationalization and preservation of Icelandic culture and values. The building that hosts this Foundation should be representative of the importance of these activities for its country, Iceland. We designed a rational building, where modulation is a key aspect. There are no architectural excess that might increase the budget, but quite singular and special at the same time, comfortable for users and interesting enough to get the pedestrians attention. The building brief is located on 3 different arms, getting a “star shape” in plan that welcomes the visitors. The lower level is completely open to the public. It has tall ceilings and will host exhibitions, cinema-theater, café, library, etc. First Level is for languages classrooms for learning different idioms, not only Icelandic, and on the Second Level there would be for Vigdis Foundation Administration offices. Construction process is designed to be efficient, quick and with a rational materials use. There would be a wooden structure (from ecological forests), easy to build. The whole building will be clad with modular mirror glass pieces and over them, there would be a double façade made with recycled boat ropes that would be denser where the sun orientations heats more directly. This secondary façade will provide a singular look to the building. It will remain the sailor Icelandic tradition or the Icelandic pullover patterns very useful on the strong winters. One unique look with an actually low investment.